Previous post: The silk in Silk Road. Next post: How they made the bread on the Silk Road. 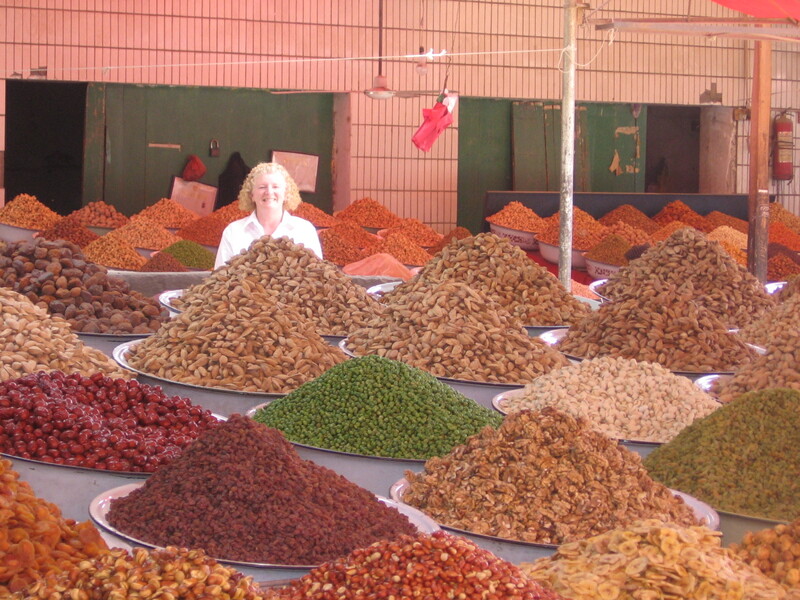 Me in the spice market at Yarkent. Markets are where you see what people are making and buying and selling. People are talking and laughing and shouting out prices and exchanging sotto voce comments with each other on how much they got for that carpet and those chairs and commiserating over the fluctuating price of a glass of pomegranate juice, and then the muzzein sounds the call from the minaret of the local mosque and the lady selling you a length of brilliant scarlet silk excuses herself and shakes out a small rug and kneels facing Mecca to say her prayers. There’s a guy making rivets from snippets of soft tin, right across the street from another guy shoeing a donkey, right next to a dentist’s office where you can stand in the doorway and watch him extract a tooth. Markets are where you see how the people in that place in that time really live their lives. I love markets. I am a total sucker for any market anywhere, anytime, from the fish market in Fatiyeh, Turkey, to the Sunday market in Kashgar, China. One of my favorite things to do when I’m traveling is to go into the local supermarket and walk the aisles. There must have been 25 different kinds of yogurt in the supermarket in Izmir. Who knew? Now, I do. I heard that story, Lee, thanks for the link! Thanks for the suggestion, Elise!